Many thanks to Ana for tagging me. Such a great, fun TAG! Mist, cleanse, tone, nourish, treat. I always mist my face before cleansing and whenever my skin needs a quick pick me up. Cleansing is my favorite part of my skin care routine because I am a bit of a clean-freak and that applies to my face as well. It is also very relaxing to me. I like to tone after cleansing to prepare my face for a nourishing moisturizer/facial oil. I treat my skin with different masks and serums. I think that the most appropriate way to define it would be combination/sensitive. Oily on my forehead (prone to breakouts) and sensitive, but not oily on my cheeks and chin. My cheeks and chin tend to get irritated very easily and are prone to redness. My eyelids, like my forehead, are very oily. What’s your favourite skin care product? Cleansers and facial oils. Aurelia Miracle Cleanser and Pai Camellia and Rose Gentle Cleanser are my current favorite cleansers and Marie Veronique Organics, Pai Skincare, and MUN make my current favorite facial oils. Honestly, the less I stress about blemishes, the quicker they go away. I try not to look at them in the mirror every hour and follow the whole evolution process of each pimple. However, I recently noticed that the Marie Veronique Organics Facial Oil helps my blemishes go away. Not sure which one of the ingredients is so healing (there are many great oils in the blend like borage, tamanu, marula, evening primrose, sea buckthorn, etc), but it works miracles for my skin. And no, I am not exaggerating. Face wipes yay or nay? NAY. Capital letters on purpose, of course. They are drying and require too much rubbing of the skin. They do not deeply cleanse the skin. 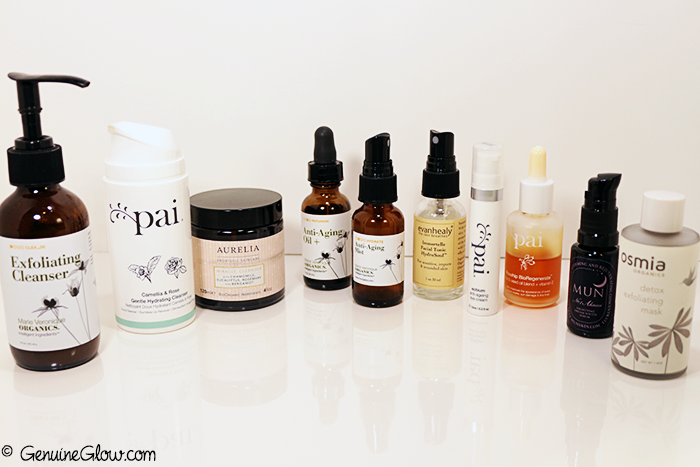 I recommend reading this article written by Sarah Brown, Pai Skincare founder. Yay, but lately I have been enjoying hydrating facial mists more than toners. High-end skin care or high-end make-up? Both! However, if I had to pick one, skincare would be the one I am willing to spend more money on. If the skin is not right, makeup is not going to look good anyway. What’s the most unusual skin care product you’ve tried? One unusual product, that turned out to be a complete failure, is Hydrogen Peroxide. I watched a Youtube video (from a popular beauty “guru”) that recommended trying Hydrogen Peroxide on the face to keep it blemish-free. It was a disaster, my blemishes were bubbling, literally. Not sure why I tried it in the first place. As for the most unusual product, that instead turned out to be a success, I used some capsules from Marie Veronique Organics called Pacific Topical Vitamin C Treatment, whose powdery content has to be mixed with any serum/oil. You’re in a pharmacy and can only pick up one item – what is it? Coconut oil. So many uses from that one jar. The most important tips to have beautiful skin are a healthy diet, avoiding sugar, drinking a lot of water, exercising, and sleeping. Your diet should include fresh produce (local and organic is best) and a ton of good fats. Sugars are the worst enemy of clear skin, (and of your health in general), stay away from them as much as possible! Drink purified water if possible and make sure to drink about 2 liters a day. Exercise, because when you exercise you release hormones, such as estrogens, that can increase collagen production in the skin¹. Sleep, get in bed before 11 pm, because between 11 pm and 1 am our skin recovers from the stress and environmental damage of the day. The best skincare products are not going to be enough if you fail to maintain a healthy lifestyle. As for the skincare routine, I highly recommend cleansing twice a day. Once in the morning, once in the evening. In the evening I highly recommend double cleansing to ensure that makeup/SPF are completely removed from the skin. If you have oily skin, do not use harsh, drying cleansers. Repeat: do not use harsh, drying cleansers. You may feel like your skin is less oily right after cleansing, but your skin will produce more oil in the following hours. I have oily skin in certain areas of my face and rich, creamy cleansers have worked so much better for my skin. Do not touch your face, unless your hands are clean. Do not use dirty, filthy makeup products on your face. Make sure to keep your makeup brushes clean. Use an eye cream. It’s never too early for that. Be extra gentle when touching your eye area, as it is more fragile than the rest of your skin. Do not smoke. It is a crime against your beauty, just like thinning brows. However, smoking is also extremely aging and dangerous to your health. Try facial oils. Do not be afraid of using facial oils, especially if your skin is oily. I do not always use facial oils in the morning, because I find that makeup may not hold up as well with oils as it will with a lightweight moisturizer, but at night I always use facial oils and have noticed a drastic improvement in my skin since I started to use them. In fact, my skin has become less oily. I TAG Kim, Britanie and Pemberly Jones. Have fun girls! (¹) Aguirre Claudia Ph.D., “Hormones and Your Skin”, The International Dermal Institute, n.d., Web. 10 Aug, 2013.